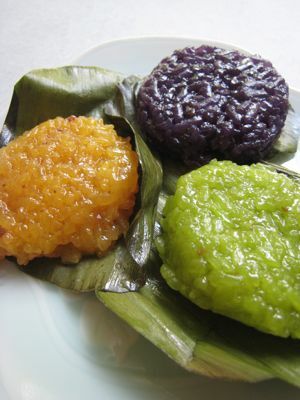 I must admit it was their looks that stopped me in my tracks… These flavored suman patties looked stunning. And with free tastes on offer, I tried all three flavors before deciding to buy a package with 8 assorted pieces for PHP60. I asked the vendor if the pandan, ube and mango flavored suman “patties” had any artificial color and while she said they were not colored, I did wonder how they got such deep and striking tones… Back home, I devoured one of each flavor… they were quite tasty… and just the right sized serving and packing enough flavor to make each distinct brightly colored pattie from the other. A beautiful addition to a pinoy kakanin type merienda platter. These were from the table at Salcedo Market, Makati with dishes from the Family Recipes Quimson (Tel. 8978557-9) and they are definitely a nice alternative to the larger and more filling suman or bibingkas that one thinks of more often for merienda fare. Yum. oh, my god, those look sooo good to eat! suman is one of my favorite kakanin. would you have a recipe for suman, mm? Hmmm….seeing this in a sunday morning makes me feel that I am somewhere in philippines. The nostalgic feeling always kick in whenever you see food that reminds you of your nanay/lola/tita who used to make them. these are from salcedo, MM? they look yummy. Estella: If you would like to try making suman, befriend a neighbour first who has banana trees in their backyard or front lawn. If you here in the Pacific Northwest, it is this time of the year that people with banana trees start pruning their trees. I ask for the banana leaves and tell them I will save tthem the task of composting them. Then carefully remove the rib and pass the leaves through an open flame VERY BRIEFLY you have a gas stove or even on the electric stove will do. Meanwhile, soak 4 cups of malagkit in water. Also soak 1 cup of purple malagkit or pirurutong or Thai Black Rice in water overnight….just the black rice. Then drain both malagkit rice and put them in rice cooker. Add 1 can gata, pinch of salt, 1/4 cup sugar, and the liquid from 1 can langka. Cook until all the liquid has been absorbed STIRRING THE RICE EVERY NOW AND THEN. Puree the langka and addd it to the rice. To make it more purple, add some of the liquid from the soaked Purple Rice while cooking the rice in the rice cooker. Then scoop them onto plates to cool them down. Cut your banana leaves ONE DANGKAL WIDE….Using a PIPING bag (DISPOSABLE or regular), fill it with the suman mixture. Cut the tip about 1 inch and squeeze the suman into 4 inch strips. roll into a cigar and fold the ends and tie the ends with strips of banana leaves. Using a piping bag will save you a lot of time and you will have 100 sumans done in no time at all. I also use piping bags when making LUMPIA SHANGHAI. To cook them,arrange them on steamer amd steam for 30 minutes more or longer. Best eaten the nxt day. I make 200 of these at a time and freeze them and then call my siblings to come and get them! I probably know the answer why the ube pattie is so ube colored… Do you know this black or violet colored rice called “Perurutong”? This rice is commonly used in making Puto bung-bung. Thank you and if you guys do this for me, I will share whatever I come up with…I miss Maria Clara and Apicio…I could surely pick their brains!!! Did you say 60 pesos for 8 pieces? I think I’ll give these away for Christmas. Cheap! betty q, i do have all the ingredients except the banana leaves. your recipe sounds really good and easy to make. the best thing, too, is that you can freeze the suman. just in case i am not able to buy banana leaves, can i use foil? Estella, My recipe is really good….if I don’t control myself, I can finish eating 1 dozen easy…no sweat at all! Between my boys and I, I have to save at least 5 dozens for us….and my friends always drop a hint and reminders about their suman share! Though I have never used foil, I know that it will work as well . Someone told me that her aunt in Toronto uses foil. But somehow, for me,… suman calls for banana leaves. It imparts a certain flavour that spells SUMAN to me!!! Where you are, are there Vietnamese stores? I buy mine at Vietnamese stores….the banana leaves I buy there are NOT THE GIGANTIC ones…they are like baby banana leaves ..more pliable than the ones I am used to. So if you can get them, they are the best ones to use. But when you open them and portion them , try to use the ones that are not broken. If however they are broken in a few places….just take a long strip wide enough to cover the tear and you can use that as well. Depending on fat you make your suman, the recipe above will yield like 4 to 5 dozens. Also, I don’t have non-stick pots and pans, so I use the first part of coooking suman in a rice cooker. The rice will not be THOROUGHLY cooked. You just cook it until all the liquid has been absorbed and the rice granules are halfway cooked. I have to tape that part of the rice cooker down and keep on stirring so I won’t scorch the bottom.since there is NO HEAT ADJUSTMENT on the rice cooker. ….BUT if you have non’stick pots, that would be ideal to use on top of the stove since you make make heat adjustments. 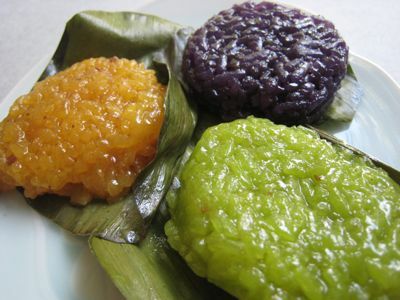 Ok….all these suman talk is making me crave for suman. …I have to go out and buy the ingredients!!! My recipe is easy but time consuming…so as soon as you have everything ready…assemble as many as you can cut banana leaves on your counter and squeeze away with your suman filled piping bag. Roll’em up and tie the ends. I find this much quicker than having to do this one by one….like 1 banana leaf, squeeze, roll and tie. …this way works for ensaymadas , too…I porion the dough into 48 balls ( my recipe yields 4 dozens…muffin size when baked)….then lay 4 balls on the counter in front of me and flatten all 4 of them with a rolling pinin just one or two strokes…, roll them into baston and shape them…You don’t have to put langka. I put langka because I like anything with langka in it…Don’t forget to add that pinch or TWO of salt. It will make a difference in the taste. OH, I forgot again!….even if you buy the frozen ones, you stiill need to singe them over a heat source VERY BRIEFLY…to make them pliable….then wipe clean with a clean damp towel. okay, now i have to look for banana leaves. yes, you’re right, the banana leaves will make the suman tastes better. good thing, i do have one bottle of langka so i can add that to the suman. i am really excited to make suman now. many thanks, betty q for this wonderful recipe!! MarketMan, your pictures are always so mouthwatering! I wish i could get those flavored suman here in nj. MM why don’t you try budbud kabog (suman made from bird seeds) of dumaguete and budbud sa tanjay (suman with chocolate and mango strips inside)? Edik, I have featured budbud kabog before…it was quite a controversy on this blog…you may want to check the archives for a good read. :) jadedfork, thank you, and nice blog you have there as well! For MM and bettyq, ever so generous with her culinary ideas and recipes. This posting will amount to treasonâ€¦.. as I promised a friend not to share this closely guarded recipe. But I shall not deprive you of this spongy puto delight the next time you have it with dinuguan. Here goes, just donâ€™t tell anyone, okay? And let me know how it turns out. Pretty soon you might even be getting orders. To 5 cups of soaked rice add water to 7 cup mark in blender and blend. Leave out to ferment another 24 hours. Place 8 c of blenderized rice on cheesecloth . Place in steamer and steam for 30 min. Steam should be going well about 10 minutes before placing in steamer. Keep steam contained with moist towels around lid of steamer. May add day old cooked rice about 1/2 c per 2 cups of mixture and blend. Let stand. Remove extra water after settling. Let stand for another 8-10 hrs. **I hr before steaming add sugar**1/2-3/4 c sugar per 2 cups of blenderized rice. Soak rice in water overnight 6-8 hrs. Drain. MM, Bettyq, in case you are wondering about the size of the steamer for the puto recipe. The 8 cups of the galapong mixture should fit a steamer almost 14 inches in diameter. You can figure how much to use if you have a smaller steamer. Please bear with me for I have a few questions, if you don’t mind…For recipe no.1: …fermentation process, I am asssuming that the room has to be fairly, warm, no?…Is finished puto’s texture similar to the one they call Puto Pasig? I am going to start on this puto quest pronto and will let you know in a few days. One thing about me is I have done what I needed to do …studied and followed my passion..honed my skills, worked with the masters in their field, reached the position as far as I can achieve …opened up and owned a pastry shop, won awards. So as far as taking orders, that is something that I don’t intend on doing anymore. I just take care of my family and bake for my loved ones at home, friends and family. Oh, MM…can you believe I got a phone call earlier from one your readers, PINKY….she told me that if I get the chance to go to Richmond, she will give me a box of Michelle’s puto so I can dissect it and hopefully come up with something close to it…Maraming Salamat, Pinky and for that I will trade a whole chocolate cake that you like!!! My father-in-law grows tapol here on Leyte … the Ube patty looks just the right color for that. My Nanay who passed away year 2002 was hailed as Puto and Suman Queen here in Houston Texas. During the mass dedicated to her, a prominent Filipino Community Official said she will be missed because not only because of her kindness but also because of her famous (always fresh and not harina) Rice Puto and authentic wrapped by hand suman. She does not like coloring any of her kakanin. Both recipes were not able to be handed down to us. My brother & sisters tried to look for it, but no luck. Thank you Bettyq and Connie for ya’lls recipe, I will try to cook it these holidays. HI BETTY Q. Of course I was just kidding about the orders. But truth be told, I have not tried the recipe yet but it is the best puto ever. I keep the recipe in my files along with other traditional authentic recipes that I eventually want to share with my family for posterity. For now, I get my puto fix from my friend who takes orders and owns the recipe so it is fine for me now. Her puto is simply the best! The variation is from another out of town friend who gave me the variation as we were sitting in a church pew at a funeral service so I COULD NOT ASK TOO MANY QUESTIONS. She says using basmati rice takes the puto to new heights. The galapong is made to ferment at regular room temperature (75 deg F at least? )unless you keep your thermostat below 70 degrees. You say you are in the Pacific Northwest? I suppose the warmer the room the better. Sorry, but I do not know what putong pasig or putong pulo are, but the recipe I shared is spongy and light. My friend also says she uses only long grain rice. She also does not use jasmine rice or the more dense slightly sticky rice favored by the Koreans and Japanese….which I think belong in the short grain category. Anyway, for now I am relying on you to find out if my friend did not omit anything from what I shared with you. Will wait to hear from you about your quest for the perfect puto. BTW, do you have a recipe for bibingka similar to the Perino’s of my distant memory? I don’t know if they are still there.I use the bibingka mix from the box, line the pan with banana leaves and top it with feta cheese and salted duck’s eggs. Thanks. Hey Connie C: Oh, no…I just soaked jasmine rice and then I open the computer and here you say…”Not the jasmine rice”…oh, well back to the drawing board! Oh, my goodness….Ferino’s bibingka is also soooo distant more like obscure from my memory bank! Anyway, this is how I learned to make it when I was 12 years old. For cost effectiveness, Ferino’s probably uses rice galapong, though I could be mistaken. MM did a post on bibingka…I have to try it one of these days. What I have uses flour. Now, rice flour doesn’t have as much gluten as regular flour. So if you want to try it, it is also good. When my sister opened her pastry shop ages ago,(19 kopong kopong!!!) I did this for her and it is one of her biggest sellers. This will yield about 4 -8 or 9 inch bibingkas. I use the round foil disposable pans. I cut the sides and fold it to make a 1 inch border high. Then line the pan with banana leaves and smear the bottom with butter or margarine. In a bowl, combine 4 cups of all purpose flour, 1 tsp. salt, 2 cups sugar and 2 1/2 tablespoons of baking powder. Set that aside. Blend together with a whisk. Then in another bowl, combine 4 extra large eggs, 2 tsp. vanilla, 1 cup melted margarine, 3/4 cup coconut milk, 3/4 cup milk. Whisk that together and pour over the dry ingredients. Whisk to blend only trying not to overmix. Divide batter into pans and top it with sliced itlog na maalat and cream cheese or feta, if you want it. Then bake 350 degrees for about 20 minutes. Now, it will be pale after you take it out of the oven. We do it this way kasi we put or sprinkle the top with brown sugar and then broil it when the people buy them. Then you serve it with grted coconut. You are one generous lady as well, Connie C , so please allow me to share one of my recipes close to my heart. I have about 10 of them. I have told MM and a few other commemters…DADD-F, Millet, Maria Clara. Tibok Tibok or Pancit Malabon?…take your pick and I will wait for your reply! Let’s do tibok tibok. And thanks so much for the bibingka recipe. It looks so rich!I think I’ll go with the flour. It will turn out much lighter. betty q, i love tibok tibok myself. i will surely try making this recipe soon…thanks! Thanks again betty q for sharing. I have the rest of my retirement trying and cooking favorite recipes. Why don’t you just write a cookbook on kakanin for posterity. You can title your book “Betty q’s Best of the Best Kakanin”. I am sure we and our children’s children will all profit from it. I used to order empanada from a neighbor. The pastry has a delightful flavorful crust that does not get soggy even after weeks of refrigeration. She stopped making them but alas, she would not share the recipe. I hope when she goes the secret will not go with her. This is one reason why I try to get recipes from the older generation or we lose them ( recipes) forever. For MM and others like you who share, I will be eternally grateful. Connie C, Estella and MM: You have to KEEP ON STIRRING THE PUDDING UNTIL THICKEND even though it’s over Bain Marie…if I have non-stick pots, I will use that and cook it directly on top of the stove with medium low heat…stirring with a “sandok size” wooden spoon. Do not use ALUMINUM bowl! It will discolor your stark white tibok tibok! My mom put whole kernel corn in her tibok tibok recipe. I prefer fresh coconut milk, than fresh homogenized milk, but now she use either of them. Cooking tibok tibok requires a lot of patience and energy because she cook with big caserola with low fire, she mix it with consistency from the bottom to avoid burning. Does anyone have the recipe for Putong Pula from Pulo? A lady from Binan told me to use both, homegenized canned milk and coconut milk (the Thai coconut Creme one). She also mixed some “corn” meal. Taste good, but with the corn meal, medio parang hindi smooth ang consistency. Ebba…what I gave you is more akin to the Kapampangan delicacy…as I remember it some 30 years ago. You see my brother-in-law and his family (siblings, etc) love to eat …so when I finally did this for them, they never ask for any kaknin except this…My version is very smooth, silky and heavenly sublime! You be the judge when you make this and let me know what you think. The reason I asked for you guys to use the fresh organic milk is you can find it…that’s the closest in taste to the carabao’s milk…that milk has the cream floating on top. But if you cannot find it then just use the homogenized full cream milk. Ours here come in 2 liter or 4 litre milk jugs. Wow! Finally got the tibok tibok recipe. Sinfully delish and sorrowfully cholesterol…hahaha. Have to perfect this. Love this……waaahhh..bad for me too…. Oooooh, I miss all the steamed sweet things from the market. My mother used to buy an assortment and steam then again at home and we’d eat them all. I am here in calgary. Can you give me your email. I do have a lot of questions. Please! Your instruction said to make latik out of 3 cups of kakang gata. What do we do withe remaining cup of coconut milk? Thank you very much for sharing this recipe. I’m planning to make this tonight for my Pastor and his wife who will visit us tomorrow.